If you depend on your phone and use it constantly, then you’re also constantly worrying about its charge. The latest entries in the myCharge line of power packs offer the same easy, portable power but with improved functionality and a greater variety of options. I first reviewed the myCharge Power Bank 6000 about two months ago, and it quickly became one of my favorite products. 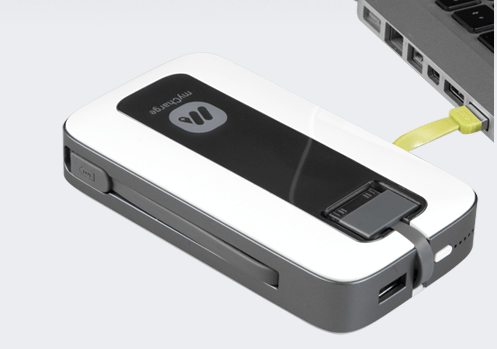 It was easy to use, lightweight, portable, and allowed me to charge multiple devices at once. Through convention season and family vacations it has been indispensable. 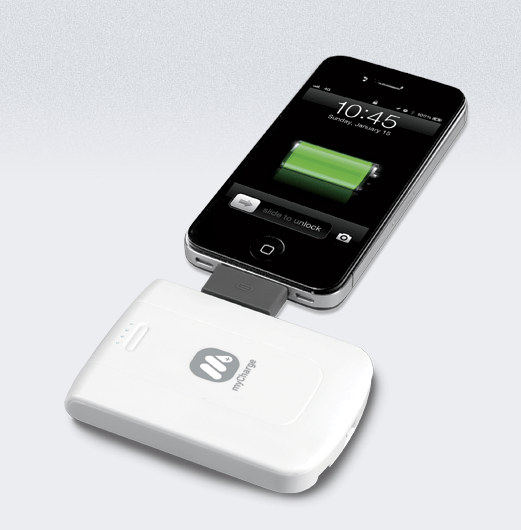 Recently, myCharge introduced a new line of battery products. They’ve improved on their existing line with new features and better functionality to address a variety of charging needs. Let’s start with one that targets Apple users. The Sojourn 1000 is a 1000mAh Lithium Polymer battery that is designed to charge either your iPhone 4S, iPod Touch 4th generation, or iPod nano 6th generation. It’s very small, measuring about 3″ x 2.5″ and just half an inch thick. It also includes a lanyard so you can hang it from a bag or purse for instant access. There’s a built-in USB charging cable that plugs into a power source like a laptop, PC, or iPhone adapter to charge the battery. This is a nice improvement over the prior model which had an independent charging cable you had to carry. It takes about an hour and a half plugged in to a wall outlet via your phone adapter but you’ll need to add another hour to that time if you’re going through a PC or laptop. Once it’s charged, the cable folds snugly into the bottom of the unit. When you’re ready to charge up your iPhone or iPod, just unfold the Apple adapter, plug it into your device, and you’re good to go. It will continue to charge until your device is full or until the battery runs out of juice. Check the battery’s charge with a button that lights anywhere from 1-4 LED lights and flashes when you’re under 20 percent. There’s also an audible tone, which can be deactivated, that sounds when devices are plugged in or unplugged, when the unit is charging and when charging is complete. If you’re looking for a heavier duty battery that gives you both more power and the ability to charge a greater variety of devices, then you’re going to want to take a look at the Peak 6000 which has a 6000mAh Lithium Polymer battery. This is an updated version of their myCharge Power Bank 6000 and it includes some great improvements. This battery operates just like the smaller Sojourn, but includes not just an Apple connector, but a micro-USB connector and a USB port so you can charge a huge variety of devices. You can even use all three at once to charge simultaneously. This is important if you’ve got, say, a phone and a tablet, or if you want to help friends keep their devices charged, too. Charging the battery up is the same as with the smaller Sojourn, but there’s a second option with the Peak. There are fold-out wall prongs that let you plug this directly into the wall without having to carry along your iPhone wall adapter. This also charges the unit faster than with the USB connector. The integrated cable and wall prongs are great improvements over the previous model. Another improvement comes in the voice notification system. In addition to the LED indicator lights that let you know the battery’s charge level, a voice will tell you how much of a charge you have left as well as when it’s charging itself or charging a device. This feature can be turned off if you don’t relish being talked to by a battery. The only negatives to this were its size and weight. This is a little heavier and larger than the previous version. It isn’t something you can easily slip into your pocket or purse, but rather something that you’ll carry at the bottom of a backpack or tote. Despite those drawbacks, I still love the product and have been using it instead of the earlier model. The Sojourn 1000 retails for $39.99 which is less than most cases with a built-in battery so it’s a great value. The Peak 6000 is considerably more expensive at $99.99, but it’s still a great value when you consider the variety of devices it can charge and the amount of extra power it provides. There are also a variety of choices in between these two that you can view at the myCharge site. I recommend both power banks. The smaller Sojourn is perfect for that extra boost your iPhone often needs and the larger Peak is the perfect choice for those with heavier power needs and multiple devices to charge. I was provided with these products for review.